Transparency is an essential part of working with CSR in NORDEN, and as a company, we strive to provide information on all NORDEN's actions and efforts within CSR. In 2015, NORDEN continued the company's efforts within the 7 focus areas in the CSR strategy "On the right course" launched in 2013. NORDEN activities within each of the 7 focus areas are described in the respective section of this report. 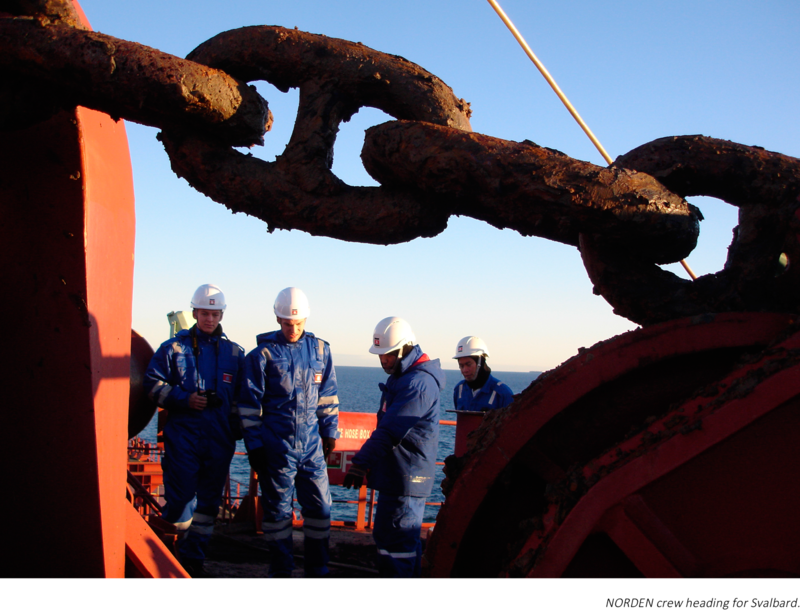 NORDEN's main focus in 2015 has been the development of a new CSR direction, roll-out of the 12 anti-corruption e-learning trainings and the completion of NORDEN’s human rights impact assessments both at sea and on shore. NORDEN reports to the CDP (formerly known as the Carbon Disclosure Project) regarding our efforts to reduce CO2 emissions and the impact of climate change on our business. Regulations which attempt to offset the impact of climate change as well as changes in weather patterns are the main consequences of climate change for the industry and NORDEN. NORDEN has been identified as a Nordic leader for the quality of climate change related information disclosed in 2015 to investors and the global marketplace through CDP, an international notfor- profit organisation. NORDEN has therefore been awarded a position on the Nordic Disclosure Leadership Index (CDLI) for the 6th consecutive year. The reported data has been independently assessed against CDP’s scoring methodology and marked out of 100. Those organisations graded within the top 10% in the region constitute the CDLI. NORDEN has scored 99 and is still the only shipping company represented in the Nordic CDLI. However, NORDEN is not part of the A list this year, as we have gone from performance band A to performance band B. This is due to a combination of reasons, such as higher activity and thereby higher fuel consumption and higher emissions than 2014, while at the same time having a decrease in revenue and number of employees from 2014 level. In 2015, NORDEN received 1 whistleblowing incident through the internal whistleblowing scheme SafeLine. The whistleblowing report was closed after a thorough investigation and was handled in accordance with the rules applicable to the scheme. The scheme was implemented in 2011 and is a means to support transparency within the organisation, providing the Board of Directors and all employees safe access to report any violations of law and regulations, NORDEN's Employee Code of Conduct and other serious irregularities.